The Claim Has Been Approved, Payment is Under Process Meaning? The reason behind this message is that the EPFO (Employee Provident FUnd Organisation) has successfully received your submitted claim & only the payment is yet to be clear. Click on the given link and it will open a new window where the members have to enter their UAN (Universal Account Number) and CAPTCHA to see the pf transfer and withdrawal request status. In most cases, the claim settlements will be done in 10-12 days after submission of PF claim forms as compared to the previous time when sometimes the claim settlements took almost more than a month. What Will Happen If Your Claim Settlement is still pending after 10-20 days? This happens rarely, but if this happens to you it will be done in maximum 30 days. Why I’m not Getting My PF Amount? What is The Reason? Sometimes, the member didn’t get their EPF Amount after claim settlement because of their inactivity of the bank account in which your PF amount has to be transferred. Resolved The Inactive Bank Account Issue But Still Didn’t Get The PF Amount? What If You Didn’t Get Your rejected PF claim forms? In some cases, the member didn’t know what to do if his/her claim settlement gets rejected due to the wrong bank details and on the other side, they can’t get their rejected PF claim forms too. If this happens, the member must visit their nearest EPF office as soon as possible with the correct and updated bank account details so the EPFO can able to update his/her details and get the Claim settlement into the waiting list till it gets settled within 10 to 12 working days. Ther said under process .how many days to calim to pf 6 month or 1 year. Every day busy say . You should go to your regional EPF office soon. plz koi to help kro. Please raise a grievance at EPF Grievance portal. Hamara 2017 rabi fasal ka claim abhi tak aporove nhi hua pls koi hamari madad krega. My UAN No is: 100105495477, My claim status showing under process from 20-11-2017. Kindly update the current status. How many days require for Settlement my claim request. my UAN No 100520814906, My claim status showing under process from 05.12.2017. kindly update the Current status. how many days require for settlement my claim request. CLICK HERE to know the correct procedure to lodge a complaint on Grievance Portal. I had applied for partly pf claim and when i checked the claim status it was showing ‘Under Process’ on 9th Dec’17, and the receipt date was also same. But since last three days when i m going to check my claim status on same website there is no data showing, means blank data is coming. What is the meaning of that???? Not sure but this must be a non-updation from the other end. Kindly wait for sometime and check again whether the EPFO has updated your status or not, If not. Let us know. Can u confirm from Sunny that whether he got money?? Am also facing the same thing..till yesterday ..My claim is showing under process..But now it is showing blank..Pls confirm whether you received your claim? I am also getting the same blank data. did u get the money? I applied for my Pf withdrawal and it’s been many days but my claim status is still under process. Can you please tell me how much time it will take, or where I can mail EPFO team to help me out. I’m unable to update my Bank details in my PF account. Always getting the error. Kindly assist me what can I do? In order to update your bank details, You can follow our given link. Read it and do the same. If you again got some error please let us know. Today I Received a sum of 17644 Rs Only, Which is near about My EPS Balance, but rest amount (Approx 34000) has not credited yet…?? I just want to know that PF Settlement usually done in one go only or can be settled in two or more than two attempts.. because I cant check the online status of claim now on portal, its redirect me on same page after filling the UAN and Capcha. Usually, PF settlements get done in 20-30 days and in a single time. You should visit your regional EPF Office in order to find the issue related in your case. I had applied for partly pf claim and when i checked the claim status it was showing ‘Under Process’ on 14th Dec’17, and the receipt date was also same. But since last three days when i m going to check my claim status on same website there is no data showing, means blank data is coming. What is the meaning of that???? You can directly visit your regional EPF office in order to figure out the issue. Am also facing the same thing..Pls confirm on your claim status.. I am also having the same issue. Can you please tell me what has happened after that. Please I badly expecting this fund. Please suggest me what can i do now? Many subscribers are facing this issue nowadays. Because sometimes the name on our PAN card is not correct. So, in that case, you have to update your Name on your PAN Card. You can follow THIS LINK in order to change your name on your PAN Card. Normally, the issue of this error is that the name registered in your EPFO Data is incorrect. So, in that case, You have to make an online request to EPFO authorities in order to change your Registered Name in EPFO database. Once your name is updated in your EPFO Database you will not get any error during PAN card updation. If you don’t know how to make online request to change/update your name in EPF database. Follow THIS LINK. I have deposit pf form on 11.12.2017 but on the web it shows that under process.my pf no is 42117/015 PL.help me. Hello , I have applied for PF claim via Form 19 and 10c on 23 Dec 2017. Today on 29th December it is showing under process. I want to know how much more time it will take to get settled. I have submitted form 19 for withdrawal of my EPF amount. Currently the status is “Claim Settled”. Can you please let me know when will the settled amount be credited to my bank account? Usually, within 20 to 30 days claims will get settled OR you should follow up with the concerned authority only. Have you received the settled amount? The status for withdrawal of my EPF amount is also same and I haven’t received the amount in my account! Hello, i have applied epf claim form 10c and 19 form submitted 30/12/2017. so how many days take to settlement of both claim? and also when it status change know your claim it under process??? plz suggest what should i do for that?? There’s no such deadline for this, You should wait for a little till your claim get settled. Usually, it will take around 20 to 30 days OR you can follow up with the official authority only. There’s no such deadline for this, You should wait for a little till your claim get settled. Usually, it will take around 20 to 30 days OR you can follow up with the official authority only. You should directly visit your regional EPF office. I have submitted of 10c form and status is claim submitted to portal. How days take for claim settlement. I am getting a status of settled, so can you please tell me I’ll get the amount or not and if yes so in how many days..
You can visit your regional EPF office. Can you please let me know when will the settled amounts be credited to my bank account. Status with Settled doesn’t mean that it’s paid to you. Settled is just an approved request by the employee. After settled status, The claim will get some time in order to get into your bank account. If you have any other query, Please feel free to ask. Status with Settled doesn’t mean that it’s paid to you. Settled is just an approved request by the employee. After settled status, The claim will get some time in order to get into your bank account. For further deep details, you can contact the official authorities by mailing at employeefeedback@gmail.com or you should visit your bank manager. I applied for final settlement of pf on 5th of January 2018.today status is claim settled.what it means and what to.e it will take to get credited I’m bank account. Settled Status means that it’s kinda approval of your request for the claim. After settled status, The claim will get some time in order to get into your bank account. You can only find your claim status on the official website, You can contact EPFO by mailing at employeefeedback@gmail.com OR you should directly visit your regional EPF office for further deep details. OR you can lodge a complaint at EPF Grievance portal for a quick action. Has been rejected due to.state bank of patiala is not authorised for pf ok.
Maybee, you should update your bank details in your EPF Account, The one which is authorised with EPFO. Your claim will surely get rejected in future as well because this bank is not authorised. So, request after request will lead you nowhere. We recommend you to update your bank details. I had my aadhar, PAN and ICIC Account details updated and verified online. I had submitted my EPF Form 31 on 12th of January, 2018 and today, 18th January, 2018, I checked the status online and it is Claim Settled but I did not get any money credited to my account. Could you please confirm if there is an issue or is there some backend process still in progress? Hope you are doing well. Sometimes, the claim will be updated as “Settled” by their end. But it doesn’t mean that it has paid to you. Kindly wait for some days(1-2), Your claim will be successfully transferred to your given account details. Appreciate your quick confirmation, Team. You guys are doing a great job as many us do not know where to get these desperate questions answered. One quick query, I did not get the status stating ‘Settled via NEFT’ or anything as many of the other querents had got. I just see ‘CLAIM SETTLED’. Will this also take 1-2 business days or will it change to ‘Settled via NEFT’ and then 2-3 business days? Thanks for your appreciation, Sometimes, Rarely we can take 48 hours to respond due to a heavy amount of queries. Keep checking our portal because we are happy to help you. I applied last month 24.12.2017. I don’t know what’s going on with my PF balance. I need my PF balance on urgent basis. Have you checked your PF Claim Status? Tell us the current status, as we are not able to comment on your issue because we don’t know the exact problem. Keep in touch and update us. Actually what i did with my PF online claim that little bit confusing . I applied for online claim. I want to withdraw my previous balance .now i am working somewhere else.. current company generate their own PF number…i applied on december 2017 now the online claim status showing ” Accepted by field office”. and the previous pf balance showing in new PF account number. Is that amount will credited to my bank account or not? Hi, I also have the same status, I did it in Feb,2018. Have you received anything from EPFO, i mean money came to ur PF account? We highly apologise for a bit long time in response, as so many requests and queries are coming related to this issue. Thanks for your precious time. Actually, your amount is automatically transferred to your new PF account number and this is a great facility by EPFO that amounts will auto transferred in your new PF account. Yes, it can credit into your bank account. i just want to know that is there any option to withdraw that amount which is transferred into new PF account number. how that amount will credit into my bank account. Can you please tell me how many days will take for final settlement? & when I can expect the amount will fully credit into my account? The claim will usually take 15 to 20 days for final settlement. After your status shows “Settled” It will take 1 or 2 business days for full settlement. Will take time to get the amount into my bank account?? Wait for 2-3 business days for a full settlement. If you encounter any issue, Kindly share with us or directly contact the EPFO department. My Current status is” has been settled. Payment sent on- 22-JAN-18 via NEFT” but i have not received. When i can expect this amount in to my bank account?? 2.Its show some in amount (at Form-10C (EPS Withdrawal/SC) EPS, Will i get this amount also? No, EPS amount stays with the EPFO. You’ll only get your PF amount in your given bank account. What about my pf amount 19355/-. Final settlement takes some business days, Kindly wait or if you didn’t get your amout, Let us know OR complaint at EPFO Complaint Portal. I have applied for partial pf withdrawal from uan online procedure however all kyc adhar and bank acc are upated. After submitted I got message “claim submitted at portal”. What happened after that please advice!! I applied for EPF on 10th of jan 2018 and now it has been more than 15 days and I have not received the money! Claim status shows under process!! I had submitted partial withdrawal on 09-01-2018 through UAN Portal and my Status as of 24-02-2018 shows Claim Settled and in portal https://passbook.epfindia.gov.in/MemClaimStatusUAN it shows claim settled Via NEFT transfer on 24-01-2018 and i understand it was long bank holiday due to Republic Day/4th Saturday/Sunday and my account details are correct as well as account is active. So i just wanted to know how many days does EPFO takes to transfer the money through NEFT transfer as its still not credited today. It will take some business days, keep checking your status. If your status is settled but you didn’t have received the amount, don’t panic, wait for some days and it will be successfully transferred to your given account details. You can also raise a complaint at EPF Grievance Cell. My name is Sunny, My UAN no.100372007797, and i have applied 2 months ago, but showing on portal 01.01.2018, and till date only showing “UNDER PROCESS” what happening i don’t know, today one month gone but the status remain same, is it working epfo or not, i need amount asap. if any other way to take amount plz suggest or tell me how many days to take action on this. You should raise a complaint in the EPF Grievance Cell so that they can take quick action against the unwanted error. Dear EPFO team, thanks for reply, I have raised the complaint already on 15.01.18 and came answer on 23.01.18 ” due to administrative reason, the delay is caused. The action will be completed in 15 days. Thank you.” now please confirm what I do for next course. It will be done or it’s playing ping pong. Please help me out. You should now wait for some days till they take any action. If the problem still exists after the given time. Let us know here. Dear Team, the latest status is ” your claim has been settled and payment sent on via NEFT on 06..2.18 but still amount not credited my account ,plz tell how many time will take to credit the amount. After the claim has been settled and payment sent on via NEFT, The amount will be credited in 2 to 3 business days. Wait and you’ll get your amount in your given bank account. My of claim status showing as “Settled” on 25-Jan-2018. Still i have not received amount in my account. can you please tell me how many days will take to credit amount in the bank account. sir my claim status showing as “settled” on apox. 22-jan-2018 . Not Amount received in my account. After Claim gets settled, It will be received in some business days. If you think it has taken so much time. You can raise a complaint in EPF grievance Portal for a quick action. If you don’t know how to raise a complaint, You can click on the given link down below. I have applied my PF withdrawal through online on 16th of Jan 2018 at 4:30 pm and same day it is proccessed to field officer of PF dept.which also got proccessed on 16th jan 2018 at 7:30 pm.Now the claim is also showing claim settled.So,i just want to know till when my amount will get cleared. The claim amount will usually settle within some business days (3-4 days) after the status showing that Claim is settled. I was struggling to resolve my problem. Thank you for helping us with all this valuable information. Keep helping like this and we’ll pray for your good. Mene 2014 me job chood de the mera UN no nahi mila tha abhi mene 3 bar PF ka form bhar ker dala lakin koi jabab nahi milta hai or online open kerne per PF claim status bhi pata nahi chalta hai iske liye muge kea kerna chaheye. EPF ने हाल ही में एक नई सुविधा लांच करि है जिसके तहत आप अपना UAN नंबर खुद प्राप्त कर सकेंगे. आपको करना सिर्फ यह है के हमारे दिए गए लिंक पर क्लिक करे और बताये गए स्टेप्स को फॉलो करे अपना UAN नंबर प्राप्त करने के लिए. I worked with reputed Life insurance Co and submitted my PF Withdrawal form but after completion of 10 yrs I have not received the same but they people are saying settlement cleared on yr 2010. Please. Advice me how can I find the missing payment. Sir I have submitted my claim form through employer on 23rd Jan 18 and same has been showing on EPF site with under process status . After 5 days no status is showing on EPF site. I am still checking on EPF site for my claim status.What is the next step. I have applied for PF withdrawal, my first application was rejected due to KYC bank details not tallied, after receiving back the application form I have updated my bank a/c details in KYC and I have resubmitted the same application form and it was delivered on 24 Jan 2018, however I didn’t get any update afterwards, i have also check in the EPFO portal but there was no update, please check on the same. My UAN number is 100059805929. If you didn’t get or found any update then it must be a non-updation from the other end. You can also file a complaint in the EPF Grievance Cell for a quick action. The time for a complete settlement can take up to 15-20 days. Once the status turns into “Claim Settled”, wait for 1 or 2 business days and the claim amount will be successfully transferred to your given bank details. Wait for 2 to 3 business days for a complete/full settlement. Let us know the complete status with a reply back. Its still shows under process why this delaying happen….? MERA 2 UAN NO HAI..MAINE PRESENT EMPLOYER KA PF WITHDRAW ONLINE CLAIM KIYA HEI..BUT SAME DAY MEINE PEHLE BALA PF ACCOUNT TRANSFER KE LIYE BHI ONLINE CLAIM KOR DIYA..ABHI MUJHE FROM 13 EMPLOYER KO SIGN KORKE DENA POREGA..BUT OBHI ME DUSRE JAGAH ME KAM KOR RAHI HU TO WO DE NEHI PAWONGI 15 DAYS KE BHITOR.TO ABHI QUESTION YE HE MUJHE PF KA PAISA MELEGI YA NEHI PRESENT EMPLOYER KA..KINDLY HELP. This is to inform you that . I had applied PF claim through online on 13th Febuary, Member ID – GNGGN00252040000115959 / Establishment Id : GNGGN0025204000 / and My UAN – 100496551373. However the status still shows as below:So please confirm when the claim will get credited to my account . also filled the KYC details. The Under Process status means that your request is in the queue and will be processed shortly. The claim will usually take 15 to 20 days for final settlement. After your status shows “Settled” It will take 1 or 2 business days for full settlement. Hi sir, i applied for my PF on 1st Feb & the status was showing as underprocess but from 25th Feb the status is not showing. My UAN no is 100242147266. Plz let me know why the status is blank. I presented the claims however as I was unaware of the total amount I did not complete that part, I assume as I am requesting the final settlement I am requesting the integrity of my PF. It has been received on Feb 6th and still under process, it is 28 days and still in the same status. Can you tell me if the fact of not filling the amount will represent any issue and how long my claim will be settle? So now, I am more concern. The status has not changed but the date of receipt has moved from Feb 6th to Feb 14th … and the amount is also wrong!!! because I don’t think so after 3.3 years of work my contribution is only 1467 rupees. Please check this asap. Claims will usually get settled within 15 to 20 days max. You should contact the EPFO Team by mailing at employeefeedback@epfindia.gov.in OR you can also submit your complaint in EPF Grievance Portal for a quick action. If you don’t know how to file a complaint, Please let us know. We will guide you step by step. I contacted employeefeedback@epfindia.gov.in and they replied that I have to contact the PF office, it was worthless. The numbers on the portal of PF office in Gurgaon are busy all the time and I started losing hope on this. Please Provide me the steps to file a complaint it is now more than a month and the status still the same. Thank you, today I finally received a message stating that amount has been approved and soon my account will be credited. Hopefully this does not take more time. Appreciate your help I think If i did not file that complaint I would have been still waiting. We’re happy that your issue is now solved. If you encounter any other issue in the future. Please feel free to ask. I need a guide for PF Form 19. Please provide the same. Don’t worry, we got you covered. Just click on the given link and it will re-direct you to a new window. Where you can easily read all the information about EPF form 19. If you have any query, feel free to ask. We happy to help our visitors. A complete settlement will take at least 10 to 15 days (as per others experiences). Please Note, If your claim status shows settle, but payment is not transferred. Then don’t worry, It will be transferred to your given bank details within 1 or 2 business days. Can you please tell how it got resolved? I am Abhijeet worked in cipla for 4 yrs ,left in 2014 and applied to pf withdraw 2 months back but still not received claim. Also to this pf account. UAN no is not submitted nor mobile no. I applied for PF Withdrawal on 28 JAN 2018 but till day i didn’t get any update about claim settlement or process. plz update me what’s the current status? I submitted my PF form few days back via offline mode and now when i checked my status it shows Claim Form 19 has been rejected in DUPLICATE RECEIPT NO. so what does it mean ??? please guide me in this matter..
Do share your experience with a reply back. I applied for a PF Advance on 05-03-2018. But still the status is showing under process may i know the how much time take to complete the procedure. I applied for a PF Advance on 05-03-2018. But still the status is showing under process. Please Advise. For a full settlement of a claim, It can take up to 15-20 days. I’ve applied for PF Claim UAN number is 100822936261. But still, my payment is not received. I’ve called the EPFO 1000 times and now, it’s been 3 months. Please guide me what can i do now? i want to my epf claim status.. I have submitted claim for PF & Pension amt. withdrawal & have also got the sms saying the claim has been received. Now i am checking on site for claim status, it is not showing anything. Pl help. Can you please tell me sir that what is EPF UAN Modify Basic Details? My friend recommened me to use the new service of epfo modify basic details to update my details. EPF UAN Modify Basic Details is a new service in which the member can update their Name, DOB and other details without filling the Joint declaration form in order to change the details. For in-depth details that, How to change Date Of Birth, How to change name in EPF UAN using Modify Basic Details. Then we have given you a link down below which will guide you step by step. I have applied for PF withdrawal and received text msg on 12 March 18 that the claim has been received in EPFO. After that I was able to see the claim status but from last 2 days I am not able to see the claim status online. Could you please help me with the next course of action? This must be a non-updation from the other end. You can file a complaint in the EPF Grievance Cell for a quick action. Hi sir I apply my PF in 3 April 2018 Online Claim Submitted at Portal so my PF withdrawal amount in my account. Sometimes settlement takes 15-20 days for a full settlement, Once your claim has been approved it will reflect in your given bank account details after 1 or 2 days. You can also submit your issues in EPF Grievance Portal for a quick action. Please CLICK HERE If you wanna know how to submit issues in the grievance portal. I applied PF withdrawal(online) on 10-Apr-2018 11:01 AM at portal, 7 business days is over. Than also claims are not verified. what is the reason? when it will get verify? Kindly do the needful at the earliest……..
I’m getting EPF Claim Status – Payment Under Process error. My request is pending since many days. If you are not happy and want to submit a complaint in the EPF Grievance portal for a quick action, Then we’ve provided you a link down below, which will open a new window where we’ve given every deep detail on how you can submit a complaint. The following claims raised for PF withdrawal, 7 business days is already over than also claims not yet verified. what is the reason? Kindly give solution at the earliest. 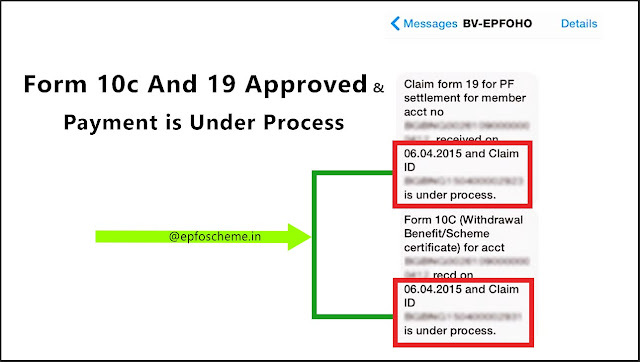 10-15 days is also over than also the claim status is showing Under process. So what should I do? Kindly assist me. Thanks so for your responsed Sir, I have sent emails many times , but I never get any response. I have submitted my Form 19 and 10C on April 9th, but in my claim status it shows äpplication submitted on April 17th 2018″and under process. so now from when should i calculate 20-30 days for approval. My Self Nitin kumar Bhatia from Rohtak , Haryana. I m Working in new delhi. I have submitted my all documents in pf office dwarka sec 23 at 15th Mar-2018. My UAN No is 100260341702 and PF No-DSNHP-0015468-000-0011585 .After 20 days ,At 5-april-2018, check the status of my claim is under process.How many days taken to clear it. I don’t have received any updated from epfo office. How Many days Claim credit in my bank account. I have called many times in given epfo number, but everytime that number is busy. Please do Needfully. I have submitted my all documents in pf office dwarka sec 23 at 15th Mar-2018. My UAN No is 100260341702 and PF No-DSNHP00154680000011585 .After 20 days ,At 5-april-2018, check the status of my claim is under process.How many days taken to clear it. I don’t have received any updated from epfo office. How Many days Claim credit in my bank account. I have called many times in given epfo number, but everytime that number is busy. Please do Needfully. status is in under process from last one month please let me know is whether rejected or actually in under process? PF partial withdrawal claim is in progress from 11th of April 2018, How will i know whether there is an issue or not, Very lazy department baddi baddi batein bas UAN is 100859280572. I have read about TDS if the employee has rendered service more than 5 yrs no TDS will be deducted and tax is fully exempted, in this case PAN not getting verified will have an impact. is PAN necessary in this case ? please help. epfoscheme.in is very interesting for me, bookmarked! I have claim my PF through online on 20th Feb 2019. Its show Under process from 20th Feb 2019. As i check today the status is same and its not change. Till when i will get amount in my bank account.